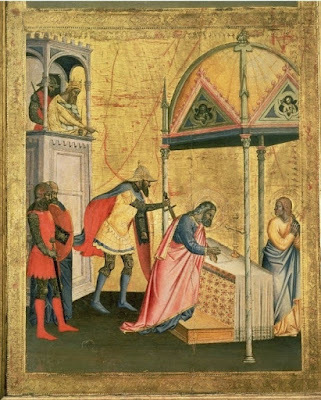 In 1367, the Florentine money-changers’ guild commissioned the painter Andrea di Cione, generally known by the nickname Orcagna, to make a triptych of their patron Saint, the Apostle and Evangelist Matthew. 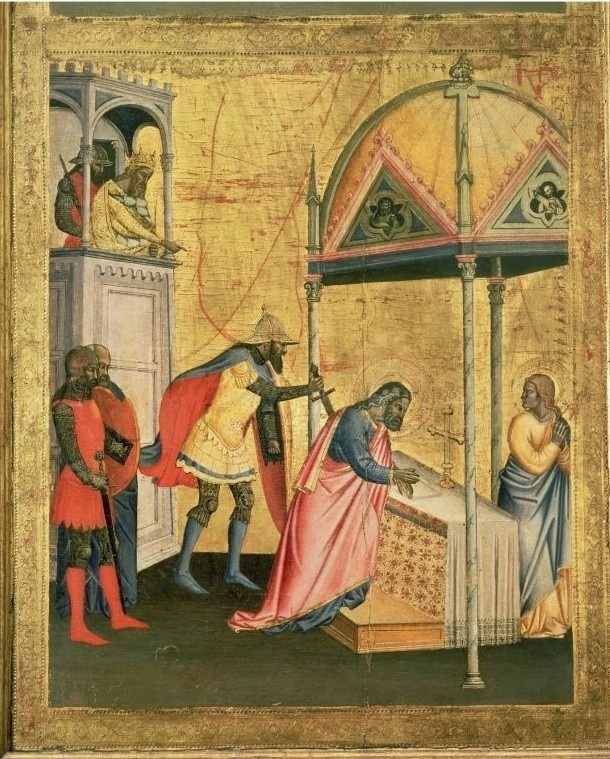 Orcagna, who was then running one of the busiest artistic workshops in the city, fell ill in the course of the work, and left it to be finished by his brother Jacopo when he died the following year. The emblem of the guild is seen at the top of the two side panels above the pinnacles. Public domain images from Wikipedia; click to see in high resolution. Its peculiar shape is owed to the fact that it was originally hung on one of the octagonal pillars of the famous church and guildhall known as the Orsanmichele. The central panel, which is mostly Orcagna’s own work, shows St Matthew with a pen and the Gospel book in his hands, the latter identified as his by the opening words “The Book of the Generation of Jesus Christ…” In accordance with the convention of the times, the beautiful decorative carpet on which he is standing is vertical, so that it can be seen; this was probably done by Jacopo. In the pinnacles above him, angels hold the crown and palms of martyrdom. 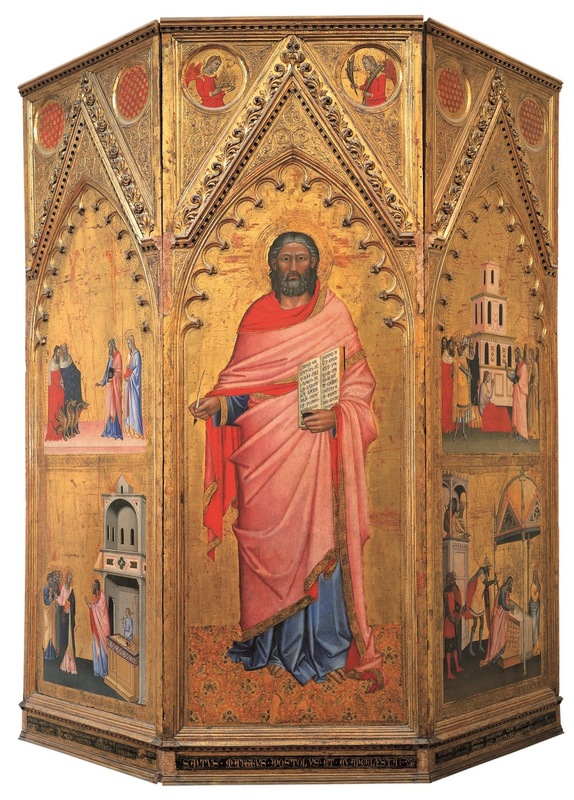 The side panels show four stories from the Saint’s life, running clockwise from the lower left. 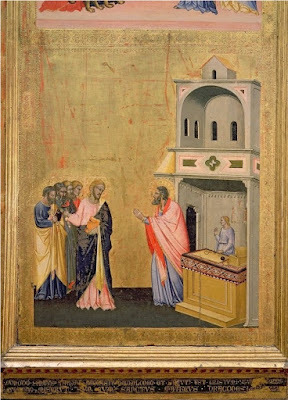 In the first one, Christ calls him away from the tollhouse, as described by Matthew himself chapter 9 of his own Gospel. 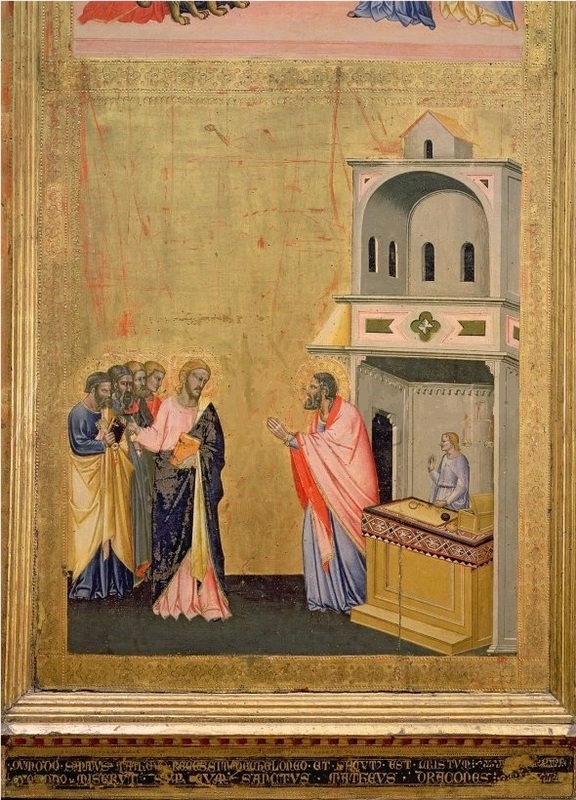 The Lord is accompanied by the four Apostles, Peter, Andrew, James and John, whose calling has already been described before this point, but the rest, who are named in chapter 10, are not yet with him. 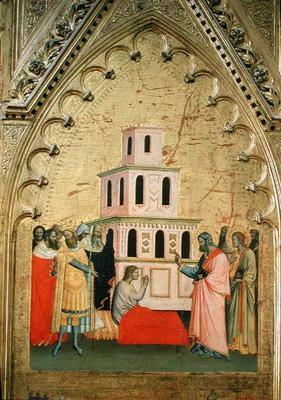 The remaining panels show stories from the life of St Matthew as recounted in the Golden Legend. In the second one, when he had gone to Ethiopia to preach the Gospel, he came to a place where two magicians had gained control of the populace, and were worshipped as gods. 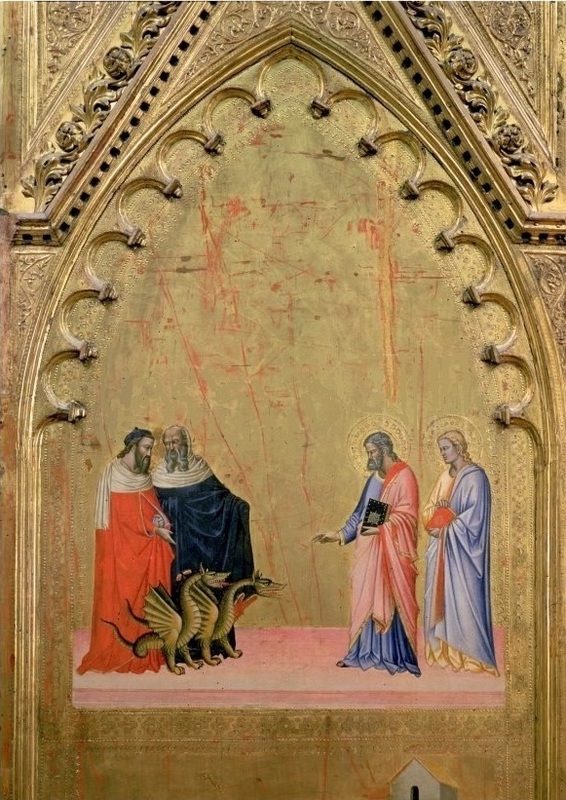 At Matthew’s preaching, the people were converted to the faith; the magicians therefore planned to punish them by turning two dragons loose on them. Signing himself with the cross, the Apostle went out to confront them, at which the dragons lay down asleep at his feet. In the third panel, he raises the son of a king named Hegippus from the dead, which the magicians were unable to do. This leads to the conversion of the king; furthermore, at St Matthew’s exhortation, his daughter embraces the state of consecrated virginity, a proposal in which she is followed by many other young women. Hegippus is then succeeded by his brother Hirtacus, who turns against Christianity, and has St Matthew killed at the altar when he had just finished celebrating Mass, as seen in the fourth panel. Iphigenia, who is seen at the lower right, is still named to this day in the traditional Martyrology of the Roman Rite. The story goes on that the people wished to avenge the Apostle’s murder by burning down the royal palace, but were restrained from doing so by the clergy, who rather celebrated his martyrdom. Since Iphigenia and the other virgins would not abandon their consecration, Hirtacus set her house on fire, but the Apostle turned the fire back on his house, which was destroyed. Hirtacus, afflicted with incurable leprosy, then kills himself, and is succeeded by Hegippus’s, who effects the complete conversion of Ethiopia to Christianity, filling it with churches.